Today, my card is for the Muse Challenge #142 and the Muse card was provided by the talented Anita Bowden of Neet & Crafty. 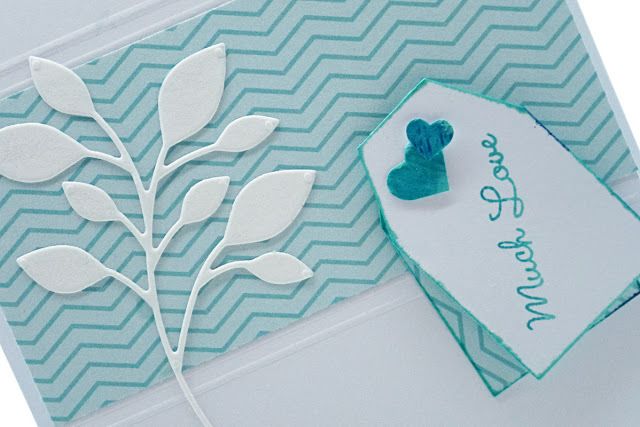 I loved the aqua shade she used and the general layout. 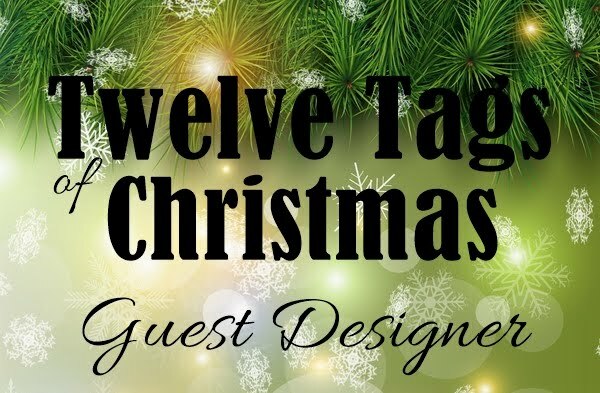 Everything, from the sweet little tag, the hearts, the leaves to the lines she embossed as a border for her main focal point. I loved it all! This is my take on her card. First, I cut the top panel a quarter of an inch smaller than my card base, then I cut a strip of patterned paper from my stash to go across the front of the card where Anita did that gorgeous stamping. Once adhered, I ran across the back with my bone folder to create the border lines. 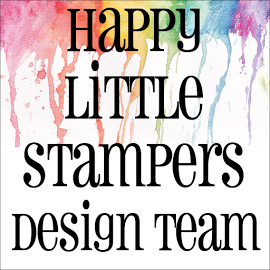 Next, I made two little mini tags by just cutting them by hand - I don't have a tag die that small - then I stamped the greeting on the white tag and sponged the edges of both tags with the same ink as the sentiment. 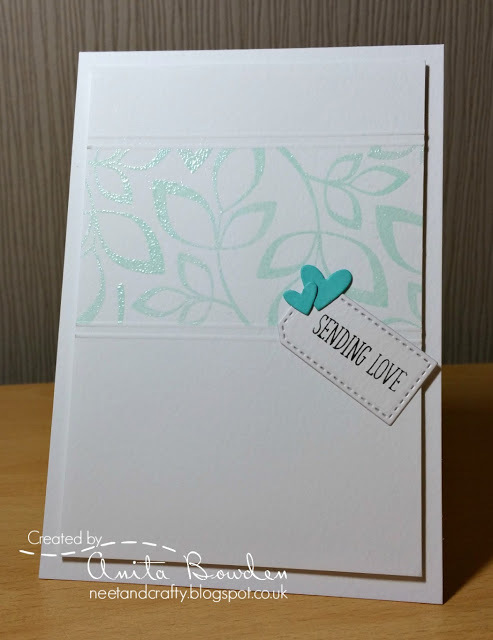 Then I used some die-cut leaves from my stash to represent Anita's leaf stamping. After that, I took my ink pad and went directly to paper for the matching hearts and used my Martha Stewart punch to punch them out. I used foam pads for dimension and layered everything up - except the leaves, which were adhered flat. Finally, I mounted the whole panel to my base card and added some WOS to the leaves and hearts. Wonderful take on the Muse! Love this color combo - it looks so light and airy! 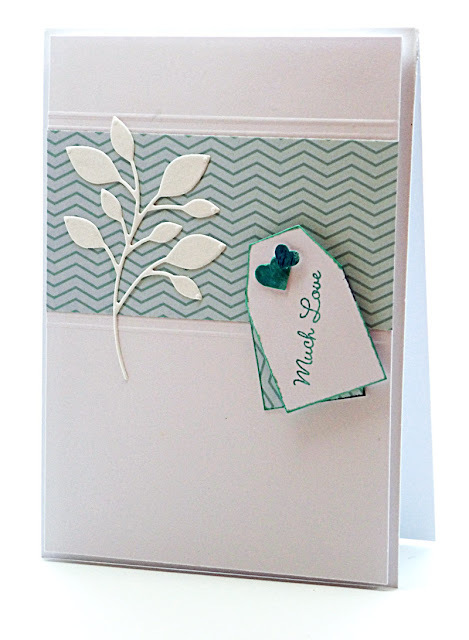 I just love your card Hazel and such a gorgeous die cut those leaves. Beautiful card Hazel, love all of it right down to the wee little hearts. So beautiful, my friend!!!!! I really like that leaves die and the cute little tags and hearts!!!! A lovely CAS card!!!! Love how you've used the DP in two different directions! So glad you joined us at Muse this week, Hazel! This is a gorgeous take on the Muse card, Hazel! 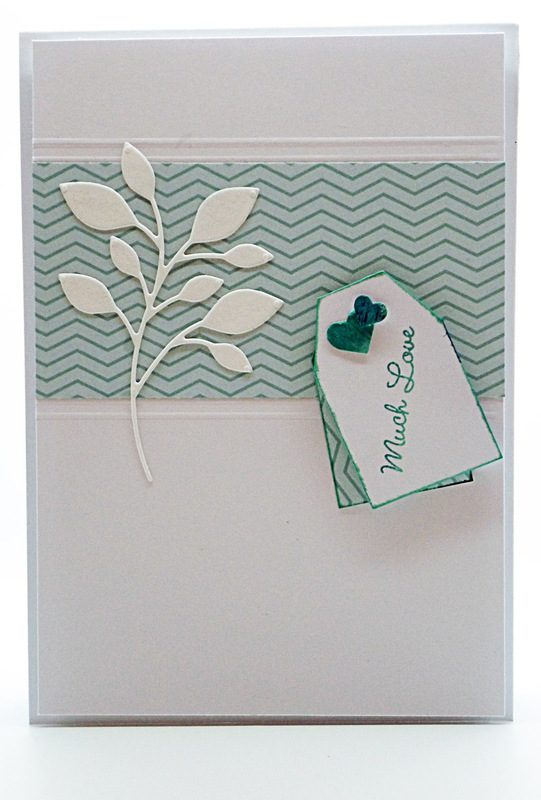 The sprig of foliage really stands out against that gorgeous patterned paper. Wonderful take on Anita's card. I love those little tags that you hand-cut (so impressed by that)!! Thanks so much for your kind comments, Hazel, so glad you liked my card. And I LOVE your interpretation. 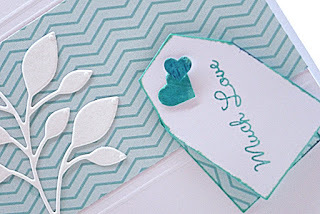 The die cut leaves look so pretty and clean against the aqua chevrons. Hola Hazel, thank you for your comment. 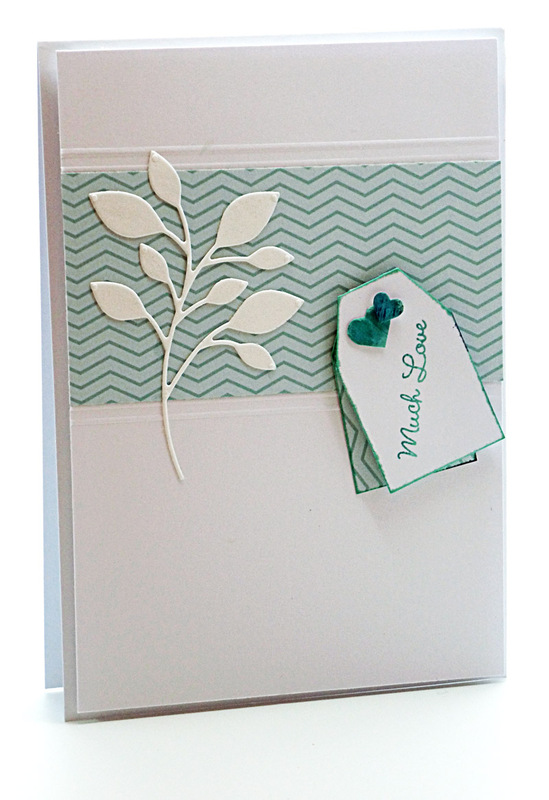 Very elegant card, i like the leaves touch, fantastic card! This is a beautiful take on the MUSE card, Hazel! The die cut leaves are perfect and I love that scoring! Gorgeous take on Anita's inspiration, Hazel! Beautiful hand cut tags and your hearts are so sweet, too! Very pretty card! 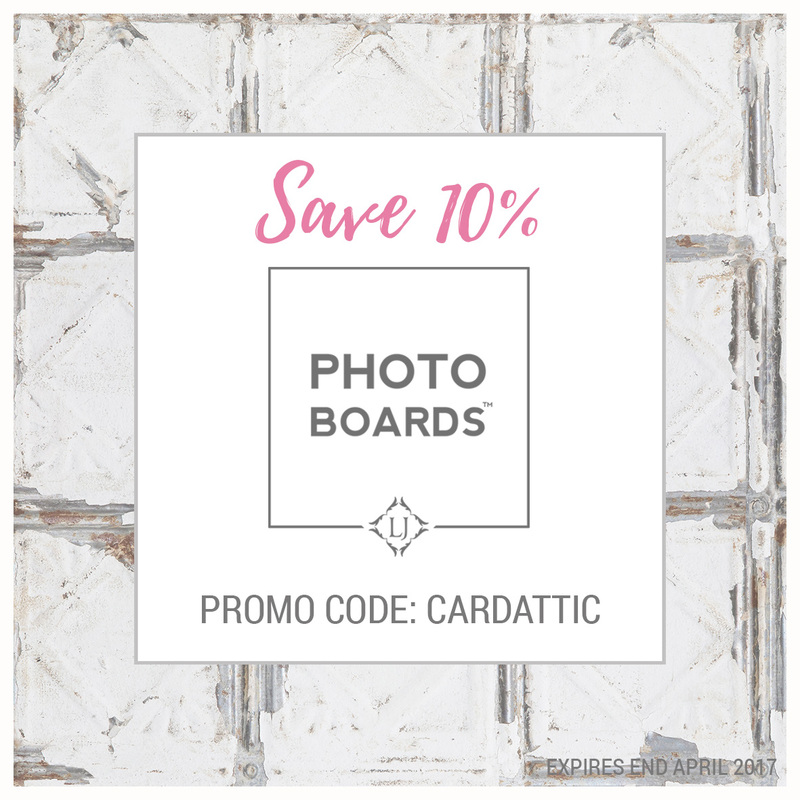 Love your chevron panel, and the white leaves, gorgeous take for the MUSE.